All our toothbrushes are made with blended plastics so they may have BPA in any of them. In regards to BPA we continually test and re-test our products and have not had any issues. If you do have any further questions on the matter please feel free to call Oral-B. If you are looking for answers to medical questions we recommend you speak with your doctor as they will be able to give you the best advice and answers to your questions. So I set out to find one. I found the wooden toothbrushes but the ones I found were from New York and came in clear plastic boxes. So I kept searching… then I found Preserve Tooth Brushes at Whole Foods. They are 100% recycled plastic from yogurt cups. plastic #5 .. no BPA. They have adult brushes and they are made here in the US. They also come with a paid mailer to send back for recycling. And..they are only 2.99! The company preserve also makes table ware as well as kitchen tools. SO glad I found your blog. 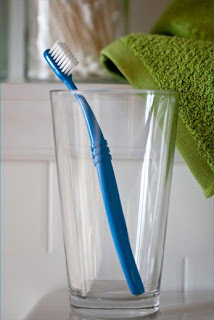 We're becoming a BPA-free household and the question of toothbrushes just came up. Thanks! FW: 10 Americans / PLEASE SIGN THIS PETITION!! Really??? Farmed Salmon is the most toxic? wow! On BPA: How Risky? How Much Concern? When to Act?